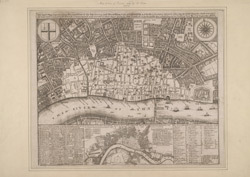 Engraved map of London and suburbs (including Lincoln Inn Fields, Finsbury Fields, Smith Fields and Bankside in Southwark) in which barren city wards contrast with bird’s eye views of surviving buildings outside the city, showing at a glance the extent of the damage to the city caused by the great fire of 1666. The map features title along the top, with arms of the city and compass rose depicted at top left and right respectively. Also by Pricke is the inset map in the panel at the foot of the plate. Entitled "A map of the Whole City of London and Westminster with the Suburbs, Whearein May Be Judged What Proportion is Burnt and What Remains Standing", this smaller scale map (two inches to the mile) is flanked by reference tables with key to churches and halls of the London Livery companies.